Moroccans are masters at making cooked salads that have a smooth, jam-like consistency, and then skillfully seasoning the mixtures with surprising flavor. This Moroccan tomato jam, adapted from a recipe in Paula Wolfert's The Food of Morocco, will be favored by those who prefer a sweeter salad or spread. Serve the tomato jam with crusty Moroccan wheat bread as a dip-like side or appetizer, or offer it as an accompaniment to sandwiches, eggs, and other dishes. To make the jam more zesty and well-suited as a condiment for meats, omit the orange flower water and add the optional spices. Roasting the tomatoes helps bring out their natural sweetness. Although you can roast the tomatoes whole, we're suggesting that you cut them in half first so that the pulp and seeds can be removed before the tomatoes become too messy to handle. If you'd rather a piquant variation redolent of Taktouka or Zaalouk, see the tips below. Preheat your broiler to medium-high heat. Line a large rimmed baking sheet with aluminum foil. Core the tomatoes, cut them in half cross-wise and discard the seeds. Arrange the tomato halves skin-side-up on the baking sheet and place under the broiler for about 25 minutes, or until the skins are scorched and can be pinched off, and the tomatoes are very soft. Remove the tomatoes from the oven and allow to rest until cool enough to handle. Remove the tomato skins and discard them. Coarsely chop the tomatoes and transfer them to a large skillet. Add the olive oil and cook over medium-high heat for about 15 minutes, stirring frequently and mashing the tomatoes while they further soften. When all the liquids have evaporated and the mashed tomatoes have begun to brown, stir in the honey and seasoning. Cook for a few minutes longer and remove from the heat. Stir in the orange flower water and adjust the seasoning. 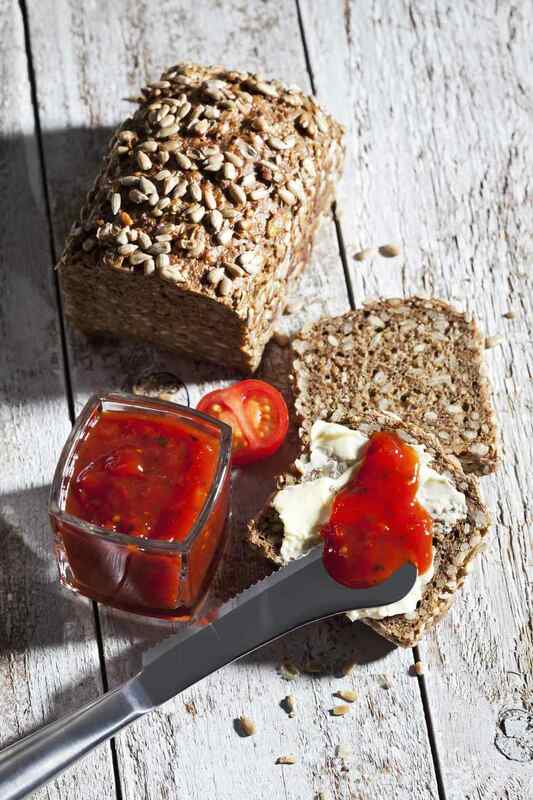 Serve warm or cold, garnishing the tomato jam with sesame seeds. Once completely cooled, the jam may be stored the refrigerator for up to one week. If you don't like sweet flavors combined with tomatoes, omit the honey, cinnamon, and orange flower water and add a little piquant seasoning instead, using a teaspoon or two each of cumin and paprika. Offer the tomato jam as a dip or spread for crusty Moroccan bread. Try serving it over vegetables, scrambled eggs, rice or barley couscous. Use the jam as a garnish to meat or veggie tagines which will benefit from a sweet touch.